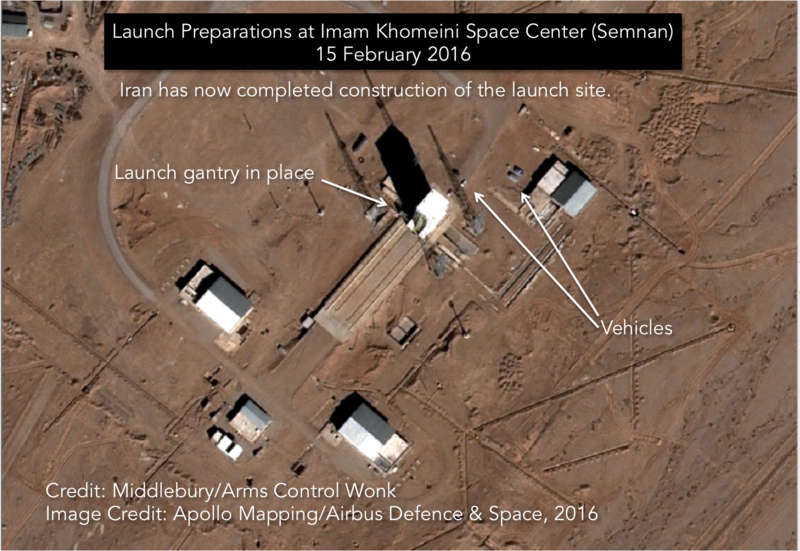 Melissa Hanham, Catherine Dill and I have acquired a satellite image from 15 February 2015 that shows Iran is preparing to launch a rocket from the Imam Khomeini Space Center. We anticipate that Iran will attempt the launch between 1-2 March 2016. Here is the image. A FAQ follows. Launch Preparations? All I see are buildings. But those buildings tell a story. 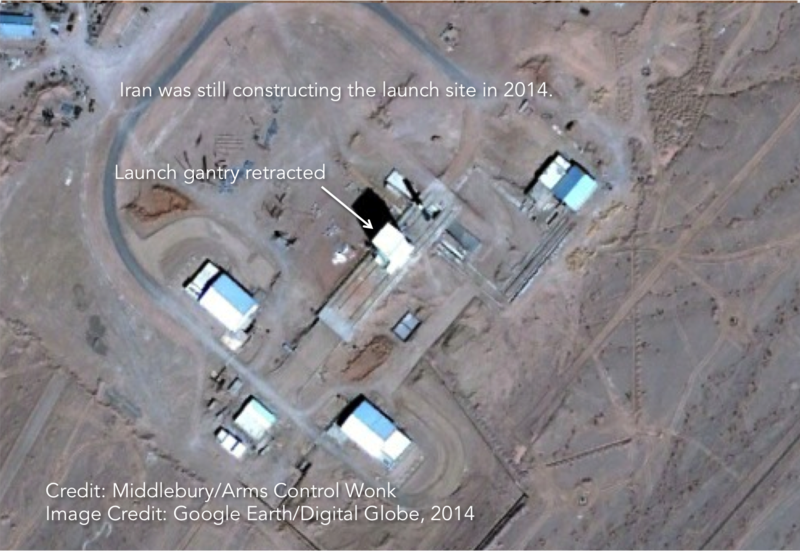 First, the new image reveals that Iran has completed construction at the site, which we call Launch Complex 2. That’s news. Second, the launch gantry, which moves along rails, is now positioned over the launch bucket. That suggests Iran is stacking up and fueling the rocket inside. (If you want to see a similar launch operation, this video from India is a good model.) Third, there are a lot of vehicles on site. That means personnel are there working. This is pretty much what preparing to launch looks like. What kind of rocket will Iran use? Iranian officials have indicated that Iran will launch a Simorgh, which has a first stage similar to the one in the rocket North Korea recently launched, the Taepodong-2. Iran has launched its smaller rocket at a different launch pad at the Imam Khomeini Space Center. Last year, President Rouhani gave a press conference in front of a Simorgh. Iran displayed a mockup of the Simorgh launcher on 11 February during celebrations to mark the Iranian revolution. We’re going to release a model of the rocket soon. Watch this space. There is a Space Center named after the Ayatollah Khomeini? Yes. We made a short movie about it for the NTI website. What kind of satellite? President Rouhani celebrated National Space Day on 3 February by unveiling a satellite called Friendship Testing Satellite. The Simorgh is designed to put a 100 kg payload into a 500 km orbit. Friendship? Are you sure this isn’t an ICBM? The first stage of the Simorgh is very similar to North Korea’s Taepodong-2. There are differences, but the Simorgh demonstrates two essential technologies for an ICBM — clustered engines and staging. That said, the Simorgh itself is not an ICBM. What the US intelligence community says is: “This technology could be used for an ICBM-class vehicle.” Our friend Laura Grego has written a nice summary of the Simorgh program at All Things Nuclear. Wasn’t there some false alarm about a rocket at Semnan before? Yep, Israeli TV did a bad job of analyzing a satellite image in January 2015. We wrote a post called “It’s Not A Rocket.” This is different: The launch site is finished, the gantry is in the proper location, and there are vehicles on site. Also, Iranian officials have said they will conduct a launch and issued a NOTAM closing the airspace for 1-2 March. Something might still cause Iran to delay or scrub the launch, but this is different. Should I light my hair on fire and run around in a panic? YOLO. A huge thanks to Brock McCarty at Apollo Mapping for working so hard to get us this image so quickly and Amy Collier, Middlebury’s Associate Provost for Digital Learning, for her support. “a satellite image from 15 February 2015” : Should that be 15 February 2016? This story is inherently parallel to your article in FP on the TD-2 ICBM (I prefer latent). Its a shame that the story lacked a Simorgh ‘marketing’ picture or line drawings so as to push off to other sources.